the Chairman of the Railway Board, Ashwini Lohani visited the Darjeeling Himalayan Railway (DHR) to take stock of the ground realities of the famous hill railway and railway’s efforts to make it sustainable. This is his maiden visit to the UNESCO World Heritage Railway as the Chairman of the apex decision making body of the Railway Ministry. 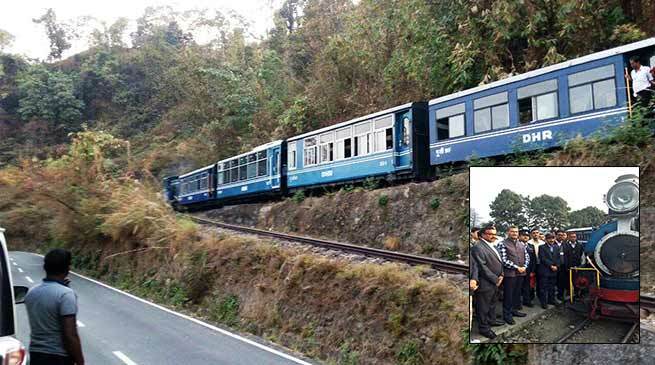 Mr Lohani inspected the entire narrow gauge section from New Jalpaiguri to Darjeeling on a special train. He has visited Tindharia workshop, Kurseong station and Loco shed, Ghum station and museum and Darjeeling Station and Loco Shed. Interacting with media personnel, Lohani said that all restoration works in Darjeeling Himalyan Railway would be done by preserving the heritage character of the hill railway. In order to bring a heritage feel, he ordered that all DHR staff be dressed in the original uniform being worn in early pre-Independence days. He assured that he would look into the possibility of reduction of fares in the narrow-gauge hill railway to make it more economical and added that second-class coach service would be started to make the journey on the train more accessible for general public. On his way, he inspected Tindharia workshop and ordered for a facelift of the workshop to be completed by 1st April this year. He also said that Senior Supervisors working in DHR would be sent for foreign training to make them aware of the superior standards being practised in maintenance and operation of narrow-gauge railways abroad. He instructed that two rail buses be made in the workshop within next six months. In a significant decision, Lohani stated that all 14 steam engines, which are the primary USP of the Hill railway, would be revived. He also said that, air-brake modification of steam engine to be done to increase efficiency and reduce manpower requirement. It may be mentioned here that railways have already entered into a MoU with Heavy Engineering Corporation for design, fabrication/manufacture and supply of spares for the steam locomotives in DHR. At Kurseong station a brief presentation was made by the UNESCO team working on the Comprehensive Conservation Management Plan (CCMP) to apprise the Chairman on the progress made on devising a plan for heritage conservation of DHR. The Chairman of the Railway Board assured all possible help from Railway side. He also inspected the air-conditioned coach developed indigenously for DHR and was satisfied with the innovation. He instructed that all first class coaches are to be made AC within a short period. He also inspected the Printing Press at Kurseong and interacted with local people including Municipality members and senior citizen association. Inspecting the museum at Ghum, Lohani appreciated railways effort to showcase the heritage of the hills railway for the benefit of the visiting tourists and enthusiasts. The visit of Lohani is significant in light of the fact that he was responsible for drafting the application for inclusion of Darjeeling Himalayan Railway in the UNESCO World Heritage list in the 1990s.